"A journey to the world's highest peaks." Greenwich Entertainment has debuted an official US trailer for the documentary Mountain, from Sherpa director Jennifer Peedom. This was first conceived as a live experience with the Australian Chamber Orchestra, where you watch and listen to them play the score live. It is also being released as a feature documentary, stopping by the London and Helsinki Film Festivals. And it's finally arriving in US theaters this May. Peedom collected the most mesmerizing and incredible footage of mountains and mountain climbing you've ever seen, and put it all together in this poetic doc about these majestic, monumental beauties of Earth. In addition, there's a narration by Willem Dafoe and a stunning orchestral score. I had a chance to see this last year and it's truly spectacular, packed with amazing footage. You can watch the original trailer for Jennifer Peedom's Mountain here, to see even more footage from this. The seemingly very human desire to seek out the top of the world, often at considerable cost to limb or even life, is only a few hundred years old. But from the moment the mountains cast their spell on us, we never looked back – or down, as the case may be. Collaborating with Renan Ozturk and other leading high-altitude cinematographers, bestselling author Robert Macfarlane (Mountains of the Mind) and the Australian Chamber Orchestra's artistic director Richard Tognetti, Peedom has framed a breathtaking visual opus. 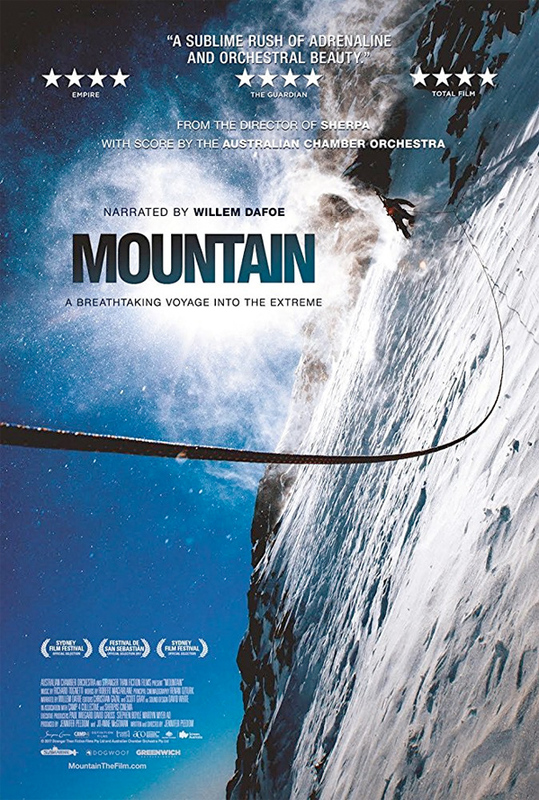 Mountain is directed by acclaimed Australian filmmaker Jennifer Peedom (follow her on Twitter @jenpeedom), of the outstanding documentary Sherpa previously. The film premiered at the Sydney Film Festival and London Film Festival. Mountain plays in select US theaters starting May 11th coming up.